Mazel tov on your child becoming Bar/Bat Mitzvah! In partnership with the Bar/Bat Mitzvah child, Belev Echad will help your child come up with an amazing project that will benefit not only your child but also others in need. We know there’s a hero inside of your child and we we will show your child many ways to make a difference in the community, and the world, and let your child’s inner hero shine through on his way to becoming Bar/Bat Mitzvah. We cannot wait to see what amazing things your child will accomplish! A Bar/Bat Mitzvah is a significant moment in a young Jewish person’s life. As you prepare for your special day, you are likely planning a charitable mitzvah project as well. Belev Echad would be honored to be the charity you choose, and to have you join our mission to help wounded soldiers. In April 2018, 7 of our alumni were gifted with beautiful Pesach presents, (and they didn’t even need to find the afikoman). They were each able to hand pick a furry companion for life. A, chose this as her bat mitzvah project, and made it happen! Thank you A! 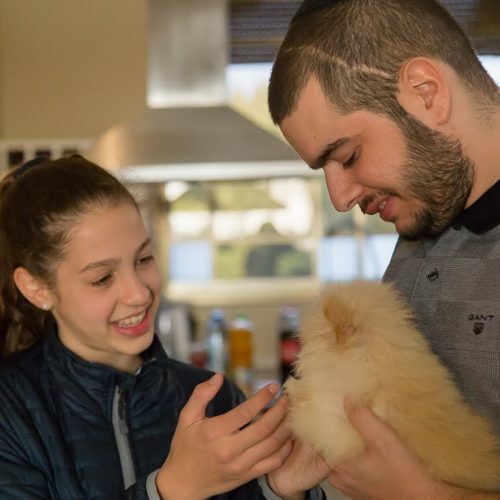 How did you hear about the Belev Echad Bar/Bat Mitzvah Project?